As I've said before, homemade pizza is a favorite around here. I've made it more times than I can count and I love coming up with non-traditional varieties. 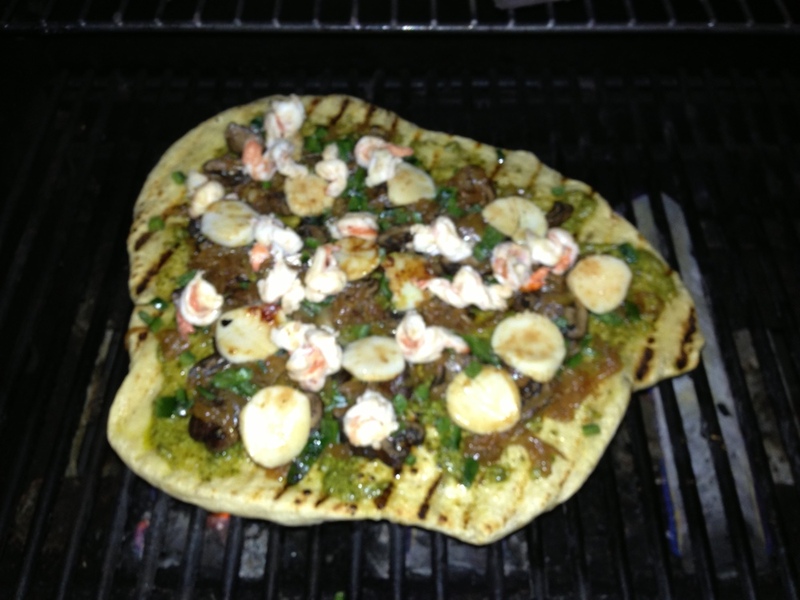 Tonight I'm making a grilled pizza with shrimp, scallops, caramelized onion, mushrooms, and roasted poblano pepper. You'll need some pizza dough. Check out my pizza dough post for all the details. 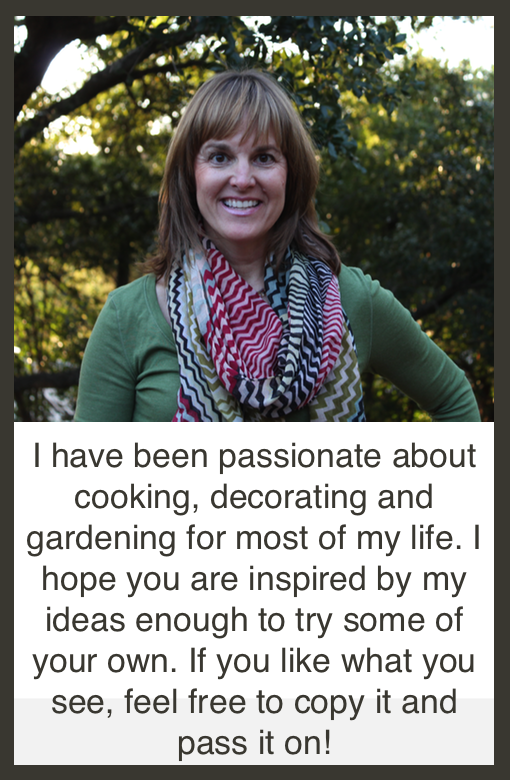 You can use store bought if you really have to, but I want to encourage you to try making it at least once. It's easy and it's so much better than anything you buy at the store. The most important thing to do when you make grilled pizza is to prepare all your ingredients so that they are ready to go. Grilling pizza is a much faster process than baking and you won't have time to get ingredients ready once you put the dough on the grill. 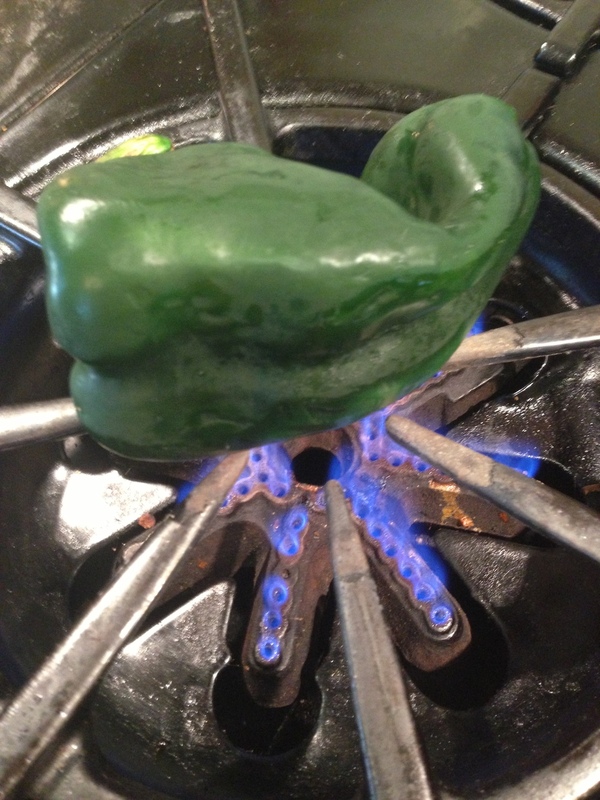 First, let's roast the poblano. 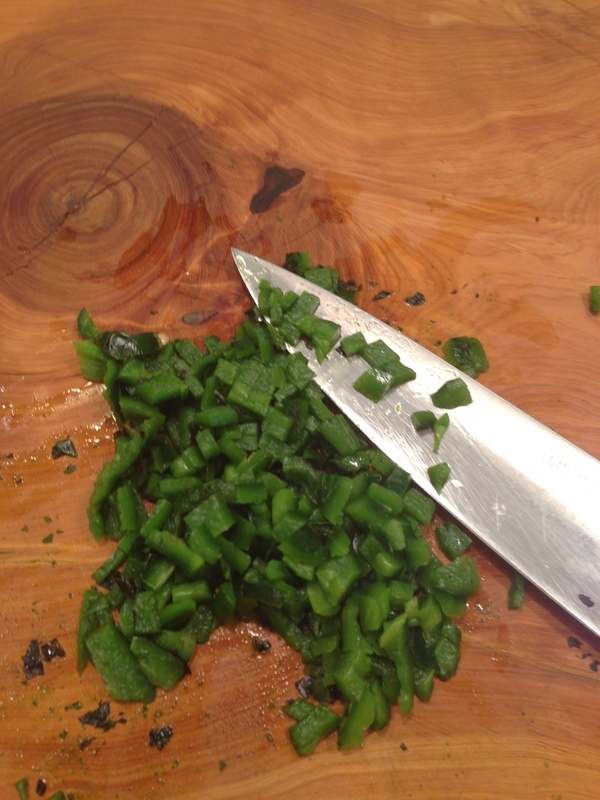 Put the pepper over a high flame until it blisters and chars, turning to get all sides. 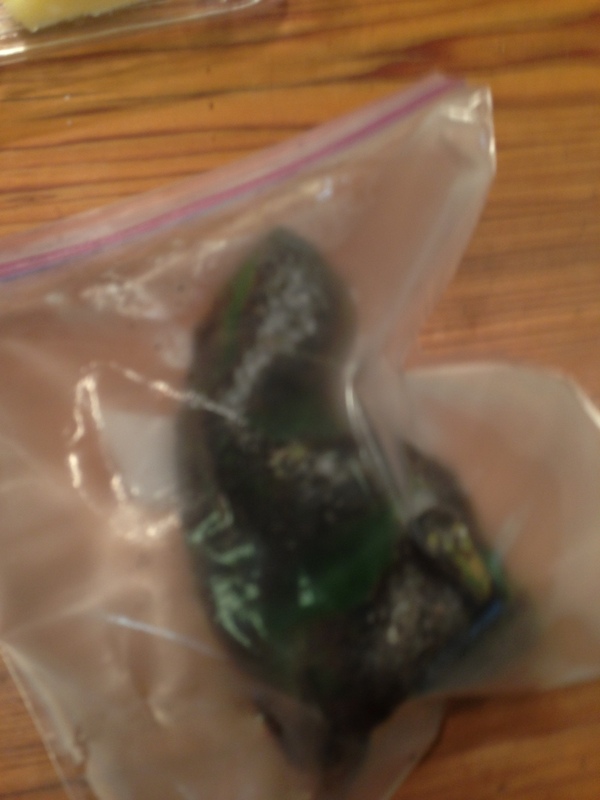 Now put the pepper in a zip top bag and seal it. The steam will loosen the peel. 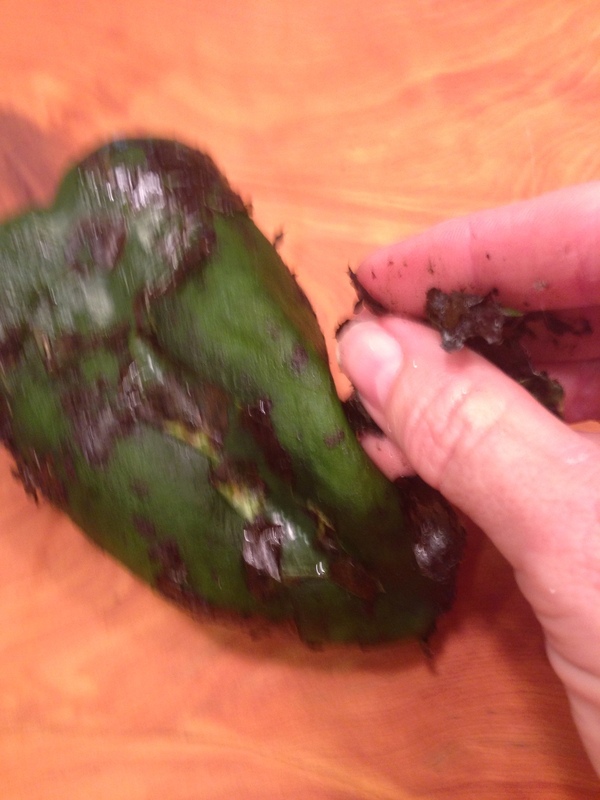 After about 5 minutes, remove the pepper from the bag and, using your hands, remove the charred peel. Don't be tempted to run it under water to clean it. You don't want to wash off all that good smokey flavor and a few bits left on just add to the taste. Now remove the stem and the seeds and chop and set aside. Now slice the mushrooms and sauté them until just done. In case no one has ever told you this, don't wash your mushrooms in water to clean them. I used to dump mine into a bowl of water to get the dirt off and I wondered why they were always so soggy. Mushrooms are like sponges and they soak up the water. Just use a cloth or paper towel to wipe off any soil. I cook my mushrooms in my dry wok on high heat. Because of the high moisture content of the mushrooms you don't need any oil or butter. Just add a little salt and stir until they're ready. After they're done, you can add any oil or butter or seasonings you like. Now for the shrimp and scallops. First peel and devein the shrimp. 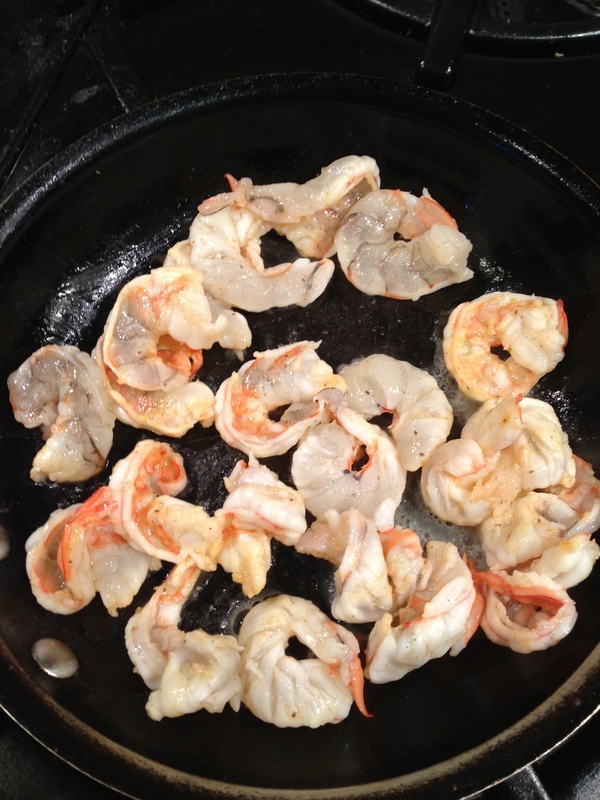 Cut each shrimp in half lengthwise so that you have 2 skinny shrimp pieces instead of one whole one. Season them with a little Old Bay and flash fry them in a nonstick skillet on high heat for about 30 seconds. That's really all it takes because you don't want to over cook them. Now clean the scallops. There is often a little muscle still attached to the side of the scallop that you need to remove because it's tough. Just give it a little tug and it comes right off. Throw that piece away. Now cut the scallops into discs. You want them to be thin so you should get 3-4 discs per scallop. Flash fry the scallops too. Just about 15 seconds on each side on high heat and you'll get a nice tender scallop with a golden brown sear. Put all your ingredients on something you can carry out to the grill, because it's time to make pizza! Fire up your grill and get it smoking hot. I have a gas grill and I light all 3 burners and leave them on high for about 15 minutes. While it's getting hot, roll out your dough. I roll mine on parchment paper because it's easy to just pick up and carry to the grill and the paper peels right off. I used to spend a lot of time making perfectly round circles, but I decided I really like the more rustic, freeform look of the irregular shaped pizza. It is homemade after all. Brush olive oil over the entire surface of your crust. This will be the side you cook first. Now carry everything outside. 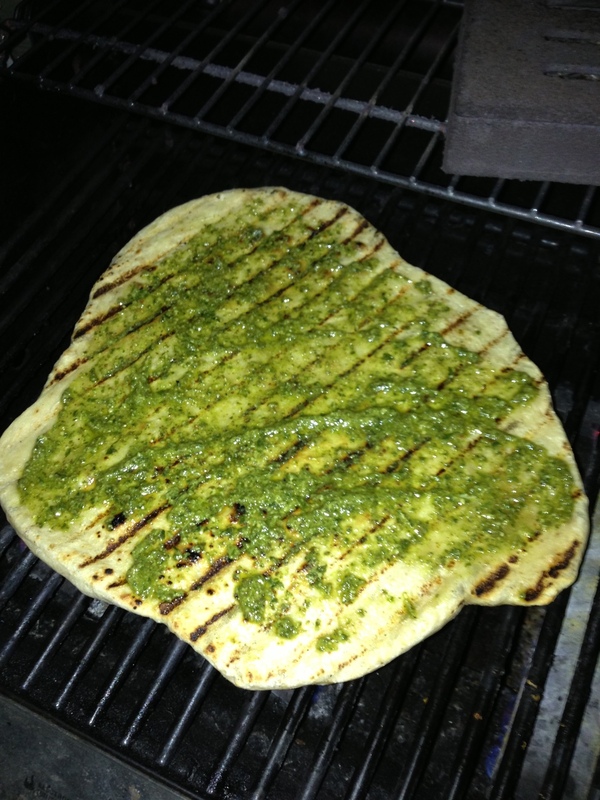 Put the dough oiled side down on your grill. The oil will keep it from sticking. 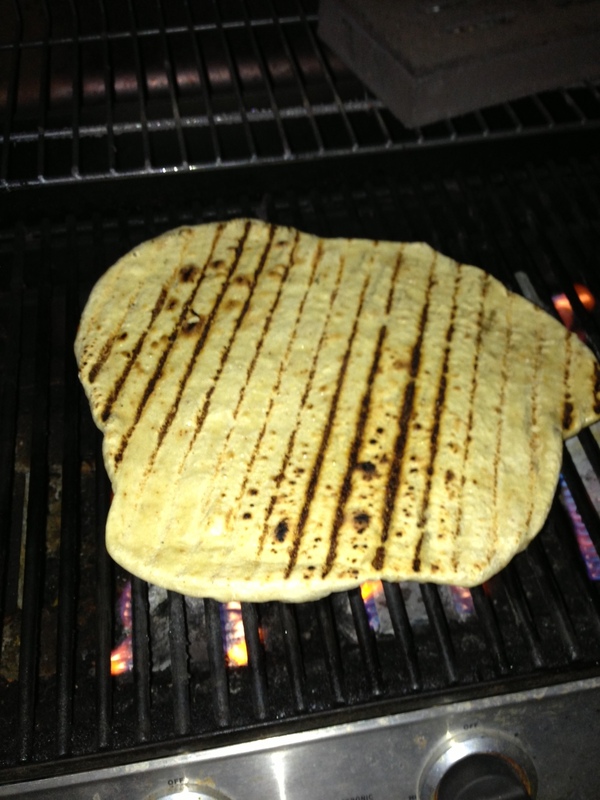 You will notice bubbles start to form on the top and the bottom will get charred grill marks. While the crust is cooking, oil the top side of the crust. This will end up being the bottom of the pizza when you turn it and add your toppings. Using a pizza peel. turn the crust. Now you can turn the heat down a little on your grill. I put mine on medium. 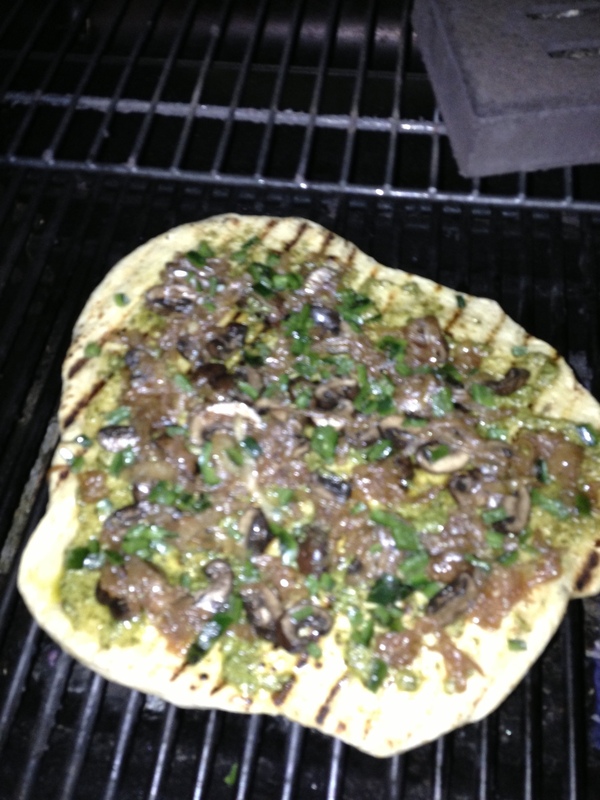 If you are using a charcoal grill, just put the pizza to whatever side is a little cooler. Spread on the pesto first. Now add the onions, peppers, and mushrooms. Next come the shrimp and scallops and finally the 2 kinds of cheese. Close the lid and let the cheese melt and the crust finish cooking. This will only take a couple more minutes and now you're done. Cut the pizza and serve. I realize that this is a really long post, but I wanted to give you as many details as possible. Don't be intimated but the seemingly endless steps. It's not as bad as it probably looks right now. The key is in the prep work. It does take a little time, but I promise the results are worth it. Posted in In The Kitchen and tagged with roasted poblano pepper, pizza, caramelized onion, pizza dough.